Here is a set of cards containing some common action verbs, which can be used in many different games. For example, a student is given a card and the rest of the class has to guess the verb. This downloadable teaching material is a great resource for elementary school students at Elementary (A1) and Pre-intermediate (A2) level. 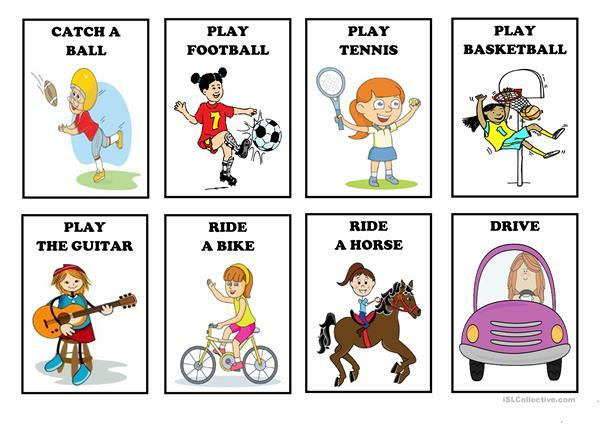 It is great for consolidating Verbs: Action verbs in English, and is a valuable material for enhancing your groups' Listening, Spelling, Speaking, Reading and Writing skills. I am a native speaker of Spanish and Galician, and I have a passion for languages. I work as a translator and a language teacher. I have been teaching Spanish, French, and English as foreign language since I graduated, and I think this site is amazing. Thank you very much to everyone for your hard work and for sharing with us!